An attempt is made to use the distribution of medieval pottery finds to try to understand the open field farming system as applied to Bingham parish and to throw some light on the process of village nucleation and the origin of the village itself. Among the most recent studies of this kind to have been undertaken is the Whittlewood project (Jones, 2004). In it several parishes in SW Northamptonshire and north Buckinghamshire were field walked at 10% in an attempt to use manure scatters to identify medieval arable farming regimes. Jones points out that there is good documentary evidence of manuring and soil improvement in the middle ages and quotes Oschinsky (1971), who had referred to several texts on it published in the 13th century. Six principal means of improving soil fertility were listed: digging in animal manure collected in yards; folding animals directly onto fields; ploughing in green manure, marling, drainage and rest or fallow periods. There is even a design for a purpose-built, horse-drawn manure cart in a 13th century manuscript. Demesne lands were manured preferentially directly by animals folded onto the fields, which as a consequence tend to have a low content of domestic waste. The common open fields were more likely to be fertilized with farmyard manure and night soil carted to the fields and thus would contain a higher content of domestic waste than demesne lands. The density of field scatters of pottery sherds is proportional to the population of the village or hamlet where the manure was sourced. The earlier pottery is found closest to the village/hamlet; younger pottery is found further away as more land was brought under cultivation. Their 12th century pottery is widely scattered, but never more than a mile away from the source village/hamlet. The density of pottery scatters falls off away from the source village/hamlet, but variations occur when there is more than one source of manure; i.e. when a village was made up of several hamlets. These conclusions only apply within a constant farming regime; i.e. all on common arable land or all in demesne land. In this section an attempt is made to test the data collected in Bingham against these conclusions. The period considered is 9th century to the beginning of the 16th century; that is, it includes Late Saxon, Saxo-Norman and Medieval pottery scatters. While there is a large area of contiguous arable farmland in the parish, the fields around the medieval core of the original village of Bingham are now built upon. The deserted village or hamlet in Crow Close, lying about 800 metres to the east of the Bingham market place, is pasture and a scheduled monument. It has never been excavated. Thus, some of the information needed to address problems of village nucleation and the origin of Bingham is hidden. Where there is a sufficiently high density of finds, the way in which data are presented is in finds per hectare on a 100-metre grid, calculated for a 10% survey. For reasons explained elsewhere we have not taken the approach used in the Whittlewood project and multiplied the figures by 10 to simulate a value for a 100% survey. There is no indication from the finds collected of any activity during the 9th century Viking period. The only item found that has a clear Scandinavian connection is a quartz schist sharpening stone thought to originate in quarries near Telemark, but it could have been brought here at any time between the 9th and 14th centuries. The earliest pottery finds recorded after the 5th to 8th century Anglo-Saxon are Late Saxon Lincoln shelly Ware (late 9th – late 10thC), St Neot’s Ware (late 9th-12thC), Derby-type Ware (10th-11thC), Lincoln Early Shelly Ware (10th-11thC) and Stamford Ware (Figure 3.25). Figure 3.25. Late Saxon and Saxo-Norman fabric types from the pre-Conquest period. The St Neot’s Ware is at the northern limit of its distribution and may not have arrived here until the 12th C. Stamford Ware fabric is mostly, but not exclusively pre-Conquest. The area of wood-pasture is postulated on the basis of the absence of any finds in the area. The distribution of early to middle Anglo-Saxon pottery collected by field walking identified four settled areas in the 5th-8th centuries. These are Margidunum, Lower Brackendale, south Starnhill Farm and Granby Lane. Whether or not there are more sites, particularly in the developed area of Bingham is not known, but in the previous section a case was made for an Anglo-Saxon settlement site on Parson’s Hill. Thus, there were likely to have been six Anglo-Saxon settlements, if one under Bingham is included, within the parish. This distribution is indicative of the classic dispersed settlement pattern that prevailed before village nucleation. The distribution of the earliest medieval finds collected in this project is quite different. While some of them were picked up close to Margidunum roundabout, the rest are scattered around the parish and not obviously associated with the other 5th-8th century Anglo-Saxon scatters. The sherds of Stamford ware fabric A, which is 10th-mid 12thC are the most numerous and are well scattered, mostly in the southern part of the parish and again not obviously associated with the scatters of 5th-8th century sherds. Taken together, these early medieval scatters seem to be indicating a change in land use probably in the 9th century from one dominated by arable farming immediately around individual, probably self-sufficient, dispersed settlements that characterised the 5th-8th centuries to a system that involved arable cultivation over a much larger part of the available land area within the parish. It is tempting to correlate this change with the introduction of open field farming. When all the Saxo-Norman pottery finds are taken into account, including Stamford fabric B, which has a range of mid/late 11th – 12th century (Figure 3.26), the concentration around Margidunum is enhanced and a southward reduction in finds density from the roundabout is apparent. Applying one of the conclusions of the Whittlewood project (Jones, 2004) this could be taken to imply that Margidunum continued to be a habitation centre through this period. There are small, isolated groups of finds around Lower Brackendale, near Granby Lane and on Parson’s Hill, and a single find near Saxondale roundabout, but none of these stand out from the reasonably even spread of background scatter in the south and east of the parish. Thus there is no firm indication from this evidence that, except possibly for Margidunum, any of the early to middle Anglo-Saxon settlement areas survived into the late 9th century. Figure 3.26. All Late Saxon and Saxo-Norman finds essentially includes the finds in Figure 3.25 plus Stamford Ware fabric B. The Domesday Book lists an area of wood-pasture measuring one league in length and 8 furlongs wide in Bingham manor. Taking a league to be equivalent to 3 miles and a furlong as one eighth of a mile, this amounts to a half of the area of the parish. The description seems to imply that this was a contiguous area, but there is no single area that size free of pottery sherds in the period late 9th to 12th centuries. There is no certainty that this area was actually in the parish. However, if it were in the parish the most likely area for unbroken wood-pasture in this period is a north-trending swathe in the west of the parish extending from the parish boundary south west of Lower Brackendale Farm through to the Fosse Way near Fosse Road Farm (Figures 3.25 and 3.26). Though the northern part of this area cannot be delineated with certainty because it is under built-up Bingham, this area is 1.2 square miles and can only meet the size requirement implicit in the Domesday Book if it included other parts of the parish that are free of finds or if it extends outside the parish. This is not unreasonable to assume. According to Rackham (1986) parish boundaries, which originally were the boundaries of large manors, did not become settled until near the end of the 12th century and we have no knowledge of the boundaries prior to that. If this area were wood-pasture it separates pre-12th century pottery scatters near Saxondale roundabout and Lower Brackendale from the rest of the parish. Pottery from this period is dominated by Nottingham Splashed Ware (58%) with a date range of early/mid 12th to mid 13th century. Other Nottingham ware types, such as the early green glazes, coarse pink and orange sandy wares and reduced green glaze made their first appearance in the later part of this period, while there are medieval sandy and glazed wares from potteries outside Nottingham from this period. Some shelly wares, sourced elsewhere, for example from Peterborough, Potterhanworth and Stanion Livedon, have long date ranges that begin in the 12th century. South of the A52 much of the good arable land appears to have been brought into arable cultivation by this period. There are some small areas with no finds in the west of the parish, but most of the swathe of land that was free of pottery sherds dating to the late 9th-11thcenturies is now scattered with sherds of Nottingham Splashed Ware and other contemporary ware types. Towards the end of this period, in 1237, an entry in the Close Rolls refers to rights of the Manor of Bingham to a regular allowance of wood from Haywood (Oaks), 14 miles from Bingham in Sherwood Forest (see Coleman, 1979). This is a common arrangement is parishes that were fully cultivated and it suggests that if the small areas free of sherds are not a result of collector bias or any other factors in the survey methodology, the Domesday Book wood-pasture had largely been cleared and any small patches of wood-pasture remaining in the early 13th century were insufficient to meet the needs of the community. The 100-metre grid plot (Figure 3.27) shows the highest concentration of finds in the parish forming a discreet area in field 2491 near Granby Lane. There is a pottery scatter immediately to the south of Margidunum roundabout with a relatively high density near the roundabout falling off to the south. Using the conclusions from the Whittlewood study both of these areas could be interpreted as having small farms in them. Parson’s Hill also appears to be under cultivation, but much of the area of the lake deposits immediately to the south and west of Parson’s Hill is not. Figure 3.27. The grid plot shows the distribution of the early to mid 12th to mid 13th century pottery, which is dominantly Nottingham Splashed Ware. The named fields are those on the 1586 map. Elsewhere, there is a higher concentration of finds in the area that was designated South Field on the 1586 conjectural map, than on West and East fields (see Table 3.2). The conjectured western boundary of South Field closely coincides with the eastern boundary of the wood-pasture. There is also a broad strip of land to the east of Crow Close, which shows variable concentrations of finds right through to the 16th century, when it is called East Meadow (on the 1586 conjectural map). This area is bounded on the west by a sinuous hedgerow depicted on the 1883 OS map and the earlier tithe map, though it has now gone. East Moor, which is to the west of the sinuous boundary, consistently has much lower densities of finds from the 12th century onwards.This suggests that the boundary was there in the12th century and that the land to the east of it was under cultivation, while on the west of it the land was waste or pasture. It is difficult to plot the full extent of this cultivated area because of housing, but surviving ridge and furrow within and to the north of Crow Close shows that this area, which was freehold in 1586, had been cultivated. No date can be attached to it, but it is unlikely not to be medieval. Interestingly, the fields around Brocker Farm have no finds from this period suggesting it might have been waste or pasture at this time. This period is approximately 150 years long, essentially covering the time of production of Nottingham green glazed wares. There is a wide spread of 13th-14th century material in Bingham with scatters found even in the fields on the lake deposit that showed no or few finds from earlier times. In some parts of the parish the finds density for this period is the highest of all periods until the 19th century. Nottingham-made wares make up 83% of this assemblage with varieties of green glazed wares and coarse orange and pink sandy wares particularly common. The source of the remainder has not been established, though a reference in a petition to King Edward III c.1330 to a potter in Scarrington suggests that there might have been a local source for some of it (Crook, 2009). The density of finds, plotted on a 100-metre grid (Figure 3.28) is no higher than 20 finds per hectare which appears to be much lower than the highest range found in Whittlewood. It may reflect on the relatively low populations of the individual supply areas, a conclusion reached in the Whittlewood study, or that the fields immediately near the high population sources have not been covered in the survey. Figure 3.28. A grid plot of early 13th to mid 14th century pottery finds. The named fields are those on the 1586 map. The areas with the highest finds densities are near Lower Brackendale Farm in the SW corner and near the Saxondale roundabout in the far west of the parish. In the Lower Brackendale area there is a diminution of finds density towards Bingham. This is apparently so from Saxondale roundabout, though it is less clear here. Another concentration of high values is in the central southern area (south Spring Farm), while there are isolated areas of moderate to high density on Parson’s Hill, Margidunum and Granby Lane. The case of Margidunum is particularly interesting. The areas of high concentration are situated on the rising ground to the north of the flat area of clay soils on the lake deposit and there is a southward decrease in concentration. The southward drop could be indicative of different uses of the land, as in later times the lake deposit was mainly cultivated as meadow. There is the added complication that the demesne land in 1586 is mostly in the north of the parish, near Margidunum flanking the presumed common land (see Figure 3.29) and there is a marked contrast between the low density of finds from the demesne lands and the high density from the presumed common fields. Whether this reflects a different use; demesne pasture versus common arable, or different manuring practices cannot be established. Figure 3.29. This map of the northernmost part of Bingham shows the extent of all the known demesne land in 1586. The distribution of pottery shows that the demesne land has comparatively low or no concentrations of pottery. Land classified as common pasture or meadow in 1586 appears to have been arable in the 13th-14th centuries. Like Margidunum, Parson’s Hill also has a moderately high density of finds and is surrounded by poorly drained land. The area called South Field in 1586, (see Table 3.2) as for the preceding period, has a higher density of finds than the arable open fields that flank it. It also has high spots of 14-20 finds per hectare, in addition to the one on the parish boundary in south Spring Farm. Their significance is not easy to establish because of the overall fairly high average density in this area. In the second half of the 14th century there was a decrease in the production of Nottingham-made green glazed wares, which were replaced by gritty wares, generally dated as coming in after 1350. Midland Purple Ware arrived at the end of the Late Medieval period, mid to late in the 15th century and carried on into the 16th century. Wares from outside the immediate region found in Bingham are Humber Ware, mid 14th-15th century and Surrey White Ware, 15th-16th century. The density of Gritty Ware finds throughout the parish is low (Figure 3.30), apparently showing a fall-off from the previous period, though a direct comparison must be treated with an element of caution. The length of time that Gritty Ware was made is similar to that for the Nottingham green glazes and coarse sandy wares, but in the earlier period several ware types were counted together, while here there is only one. However, for the late 14th century and much of the 15th there appears only to have been Gritty Ware and it fulfilled all the functions of the earlier ware types together, thus making a direct comparison acceptable. Labour shortages after the Black Death led to the abandonment of some of the arable land or leaving it fallow for longer periods. Labour shortages led to a reduction in the amount of manure from farmyards being spread, with a consequent reliance on direct manuring by folding animals onto the arable fields. The diminution in population reduced local demand for arable products. A lower population required less pottery. The disappearance of Nottingham-made green glazed wares during the second half of the 14th century might indicate a collapse of the pottery industry there after the Black Death and, therefore, in supply. While it is possible that the Gritty Ware was made in Nottingham, some of the Midland Purple that followed could have been made in Ticknall in South Derbyshire. It is unlikely that the imported wares found of this age; Humber Ware and Surrey White Ware, were being brought in to replace the Nottingham wares because the amounts of them found are so very small. Overall, the distribution of Gritty Ware shows a number of areas devoid of finds, including the whole of Parson’s Hill, the lake deposit to the south and the parish boundary fields to the north. There are several substantial patches free of Gritty Ware in the southern half of the parish, particularly in what in 1586 was called West Field. With regard to density of Gritty Ware, areas around Saxondale roundabout, Lower Brackendale and Margidunum all have highest density squares, while there are several areas of high concentration in what later came to be called South Field. There is a hint that Granby Lane retains its individual status, even though the levels are much reduced. As with the earlier wares there is a generally higher concentration of Gritty Ware in the area that is shown as South Field on the 1586 conjectural map of the parish than the two arable fields that flank it. A plot of Midland Purple Ware (Figure 3.31), which followed on from Gritty Ware in the 15th century and extended into the 16th century, shows maximum densities a little lower than for Gritty Ware. Though there are many areas with no finds, they are not as large as for Gritty Ware. For example, Parson’s Hill and the area around, which was devoid of Gritty Ware finds now has a well-dispersed, low density spread of Midland Purple Ware. The most noticeable difference between the two plots is in the several areas around the margin of the parish that showed concentrations of high-density finds in earlier periods. Of these, only Margidunum remains distinct. Parson’s Hill, Granby Lane and Lower Brackendale are all indistinguishable from background. Saxondale roundabout, though lacking the highest density category on the 100-metre grid plot, however, has the highest overall concentration of Midland Purple Ware of all areas. The area referred to as South Field in 1586 again has a higher average density than the two open fields that flank it and contains more high density squares than anywhere else (Figure 3.32). Figure 3.22. The highest density grid squares for three periods overlain on the 1586 open field map. Where the highest density squares for 13th-14th C and Gritty Ware coincide the square is shown as green. The distribution of finds for the 5th-8th centuries identifies four areas on the margins of the parish where there was a strong likelihood of Anglo-Saxon settlement. Two other sites, Parson’s Hill and somewhere within the present day centre of Bingham are also postulated to have been Anglo-Saxon settlement sites. The plot for the pre-Conquest, late 9th to 11th century finds (Figure 3.25) does not show this same pattern. Except for Margidunum, which continues to stand out as a discreet entity, all the other areas containing Iron Age to Anglo-Saxon clusters are not distinguishable within a general, wide scatter of sherds. This distribution pattern suggests that the agricultural regime has changed from individual self sufficiency around dispersed settlements to one in which wide areas of the parish had come under arable cultivation and with this change all the dispersed settlements, except possibly Margidunum, had disappeared. The main inference from this is that at some time before the late 9th century village nucleation had taken place and that one of the settlements, probably the one under present-day Bingham, had grown into a village. Although south Nottinghamshire is outside the core of the ‘champion lands’ of the Leicestershire, Northamptonshire and north Buckinghamshire, this interpretation would fit with the conclusions of Williamson (2003) that in the core area, where open field farming was practised, village nucleation took place as early as the 8th or early 9th centuries. The main manor (Earl Tosti) had land for 5 ploughs as well as 4 demesne ploughs, and also 14 sokemen (later freeholders), 26 villeins (later tenant farmers), and 5 bordars (later cottagers). Although this does not mean necessarily a nucleated settlement it was obviously a sizable place. The two smaller manors (Helgi and Hoga) had between them land for 1 plough which amounted to 5+ bovates of land and 24 acres of meadow, farmed by 1 sokeman, 8 villeins and 1 bordar. These possibly imply the existence of two outlying settlements. This could be regarded as indicating that Bingham consisted of three individually owned and farmed parts at the time of the Conquest, each with its own settlement or farmstead. It was as a result of the Conquest that they were brought together into one manor under the ownership of a Norman lord. It says nothing, however, about how the largest of the manors was divided up; whether it was farmed as a single unit or as several small peasant farms. We are only sure that Bingham was managed as a single estate with all the population living in Bingham itself in 1586. The suggestion that village nucleation may not have been completed in Bingham may be unusual, but there are circumstances that apply to Bingham that make it a realistic option. Bingham has never been part of a monastic estate and has only had a resident Lord of the Manor for a short period in the late 13th and early 14th centuries. The manor was acquired in 1266 by Ralph Bugge, son of a Nottingham wool merchant of the same name. Bugge acquired substantial estates in both Willoughby-on-the-Wolds (where he settled one of his sons, who founded the de Willoughby family, later of Wollaton Hall), and at Bingham where he settled his other son, Sir Richard de Bingham, who was an important figure both in the county and in Bingham between c.1275 and 1320. Although Sir Richard de Bingham is suspected of having been responsible for some improvements to Bingham village itself, there is no evidence in the distribution of finds from his period of occupation that he changed anything else. His family continued to own the manor until they died out in c.1380, and it eventually passed by marriage to Sir Thomas Rempstone, a national figure whose estates were based at Rempstone in south Nottinghamshire. So far as can be ascertained, the Bingham estate has been owned by absentee owners and would have been run by stewards or bailiffs, some of whom were relatives of the lord, throughout nearly all of its history. Thus, with no resident Lord, one of the economic drivers for the change from dispersed settlement to fully nucleated village was missing. Within the core area of the Midlands ‘champion lands’ once village nucleation had taken place it was not reversed. The finds distribution in Bingham parish, however, seems to suggest that this was not so here. The key map is the distribution of mid 13th to 14th century material (Figure 3.28), which shows a very distinct patterning to the distribution. There are five discreet areas of high values. These are Margidunum, Parson’s Hill, Granby Lane, Lower Brackendale and Saxondale roundabout. Although they do not all contain grids with the highest density category, they all appear to be isolated, showing a fall-off in density away from high points at their centres and they have a belt of low value grids around them. All these sites are around the margin of the parish at a distance of from 1 to 1.75 miles away from the current Bingham town centre. Within South Field there are four, high-density100 metre squares, including two side by side near the southern parish boundary in south Spring Farm. These areas are not isolated in the same way as the other areas of high concentration. The economics of moving manure to a heap that may be as much as1.75 miles from Bingham and then spreading it at a later date, rather than carting it directly to the farmers’ strips and spreading it immediately. Neither is easily explained. All the sites are within what were open fields in 1586 and there is no evidence of early enclosure. It is, therefore difficult to postulate conditions under which is economically viable to carry the manure to a site at the margins of the parish, dump it then spread it later, rather than to carry it into the open field and spread it immediately on the strips where it was required. It is suggested that the more likely explanation for these sites is that they mark the locations of farms. Throughout the period late 9th to late 15th century there is an apparent clustering around Margidunum. From the late 9th to mid 14th century there was some sort of activity on Parson’s Hill, then it abruptly stopped. There is no clustering of Saxo-Norman fabric types at Lower Brackendale, Saxondale roundabout, south Spring Farm and Granby Lane. In the 12th century Granby Lane appears as a discreet, isolated area with the highest density of finds in the parish. On the distribution map for the 13th –mid 14th century areas of high concentration reappear at Lower Brackendale Farm and appear for the first time at sites on the parish boundary near Saxondale roundabout and south Spring Farm. Williamson (2003) makes it clear that there appears to be no consistency in the pattern of nucleation in the English lowlands. Challis (2002) quotes Taylor (1983) that contrary to the apparent evidence of the Domesday Survey, the Late Saxon settlement pattern of lowland England was largely one of dispersed farmsteads and it is probable that administratively-linked groups of such farmsteads formed many of the vills recorded at Domesday in 1086. Williamson (2003) demonstrates that in Bedfordshire, south Huntingdonshire and west Cambridgeshire, which are outside the core ‘champion lands’ of the Midlands counties, village nucleation probably took place in middle Saxon times, but he postulates that here population growth in the 10th century onwards led to the establishment of new farms and hamlets around the margins of vills. The persistence of Margidunum as a possible farm or settlement site throughout the period up to the 15th century seems to indicate that the process of village nucleation, if it ever happened, was not completed, giving some support to the interpretation of the documentary evidence given above. There is also a hint that also throughout this time the activity on Parson’s Hill might have been associated with a continued habitation there. Two of the other sites, Granby Lane and Lower Brackendale, are, like Margidunum and Parson’s Hill, places where there is a history of probable settlement dating back to the Iron Age. Thus, although it appears that village nucleation could have taken place in Bingham some time before the late 9th century, the process was not complete and by the 12th century new farms had begun to reappear around the parish boundary, reaching their maximum development in the 13th to mid 14th century. There is, however, an alternative explanation. One of the most difficult things to demonstrate in an analysis of this kind is continuity of activity through time at any one site. The chronology of the pottery fabric types found in Bingham is not refined enough to be sure that apparent continuity does not mask breaks of 50 years of so. What is clear, however, is that in the areas around Margidunum, Parson’s Hill, Granby Lane and Lower Brackendale Farm, finds distribution seems to indicate that there was settlement for various lengths of time during the period Iron Age to 14th century. If village nucleation did take place in the 9th century, the question must be asked why, when farms or hamlets began to be re-established in outlying parts of the parish from the 12th century onwards, were some of them put in areas that had had a history of around 1500 years of occupation prior to the postulated village nucleation in the 9th century? The answer could be that they were never unoccupied. The evidence for early nucleation is largely negative, being based on the absence of clusters of late 9th to 11th century finds in places that had previously been identified as settlement sites on the basis of clustering of early to middle Anglo-Saxon finds. The amount of pottery recovered from this period, which covers about 200 years, is very small. Arguments are presented elsewhere to interpret the change in distribution pattern seen after the late 9th century as signifying a change in agricultural regime from stock rearing with limited arable land around settlements to widespread arable. Under these new conditions, if domestic waste were disposed of in farmyard middens rather than pits adjacent to housing, it would have been spread over too big an area to show significant clustering. Only when the quantity of pottery used significantly increased in the 12th century onwards do the distribution maps begin to show clustering again. There are three sites for which this argument probably does not apply. At the double-ditched enclosure at Starnhill there are no finds dated after the 5th-8th century pottery. At south Spring Farm, there is no evidence of clustering or occupation before the 13th-14th century. Neither is there any evidence within the parish of Bingham for occupation before the 13th-14th century in the area around Saxondale roundabout. Here, however, there is evidence from as yet unpublished work, of occupation in the Iron Age and Roman times just outside the parish. If the conventional explanation that the early to middle Anglo-Saxon sites were deserted before the late 9th century is to be accepted, then a case has to be made to justify the disappearance of settlements that appear to have been in existence for up to 1500 years only for them to reappear again at the same places in the 12th century and later. In addition, as will be discussed later, there is evidence that Bingham village was remodelled in the 12th century. It is counter intuitive to suggest that at a time when Bingham village was being modernised and given a main street and back lanes, that the lord of the manor at the time would have encouraged the creation of new farms around the margins of the manor. There is no way of knowing what the impact of the Viking raids or settlement was in this area, but overall the strength of argument in favour of the conventional model of early nucleation then the later re-establishment of farms on the parish boundary must be weakened by the apparent creation of new farms in areas that had been occupied from the Iron Age possibly to the 9th century. Whether or not there had been continual occupation of the settlement or farm sites around the parish boundary or a re-establishment of farms there from the 12th century, there is fairly good evidence that they went into decline after the Black Death. This event, which reached its climax in 1348-49 AD, lead to the death of between a third and a quarter of the British population and inevitably had an impact on Bingham. The distribution of Gritty Ware, which covers the period mid 14th and 15th centuries, shows several areas in the parish that are devoid of finds, suggesting that they may have reverted to woodland, waste land or pasture. Among these areas is the whole of Parson’s Hill. Of the farms sites that existed around the parish boundary in the period up to the mid 14th century Margidunum, Saxondale roundabout and Lower Brackendale Farm appear to have survived, but Parson’s Hill had definitely gone, Granby Lane and south Spring Farm do not have a distribution of finds that distinguishes them from background. Midland Purple Ware, which came into production during the mid 15th and continued into the 16th century still shows a discreet clustering around Margidunum and a weak concentration at Saxondale roundabout, but none of the other sites are distinctive. It is concluded that the decline in the farms around the parish boundary started at the time of the Black Death in the mid 14th century and over the next hundred years all except at Margidunum and Saxondale roundabout became extinct. The finds scatters in the fields south of the Margidunum roundabout provide evidence of Iron Age and Roman activity prior to the Anglo-Saxon occupation there during the 5th-8th centuries. The pre-Conquest Saxo-Norman pottery here is difficult to interpret. Including the St Neot’s Ware sherd there is a greater diversity of fabric types here than anywhere else in the parish and is concentrated close to the roundabout. However, St Neot’s Ware is at the northern limit of its range here and is thought not to have arrived until the 12th century. When all Saxo-Norman fabric types are counted, both pre and post Conquest (Figure 3.26) there is a clear clustering around Margidunum. From this period right through to the time of deposition of Midland Purple Ware there is a high spot here surrounded by lower density values (Figs 3.28, 3.30 and 3.31). This is the clearest evidence of all the sites that were identified as Anglo-Saxon settlements that there is the possibility of continuity of occupation through the Medieval period. Figure 3.30. The distribution of Gritty Ware overlain on the 1586 open field map. Figure 3.31. The distribution of Midland Purple Ware on the 1586 open field map. There is evidence from parts of the south Midlands that appears to indicate that some Anglo-Saxon estates were direct continuations of Romano-British estates with a villa at the centre. The Roman Margidunum town lies over the junction of four parishes. Villas have been found in two of them; one was found by field walking at Newton, some 500 metres south west of the Margidunum town centre (Kinsley, 2005; Kinsley et al., 2005), another in Car Colston some 2km to the north (Blagg, 1970 and O’Brien 1977). Recent field walking in East Bridgford parish found evidence of a high status Roman building, possibly a villa near Pancake Hill. No evidence has been found yet of a villa beneath modern Bingham. The archaeological evidence from Carnarvon School is inconclusive and has been interpreted both as a Romano-British farmstead and a villa. This raises the possibility that the four parishes, East Bridgford, Car Colston, Bingham and Newton (now part of Shelford and Newton CP) may first have been Roman and then, later, separate Anglo-Saxon estates. An alternative view is expressed by Bishop (1981), who looked at the Nottinghamshire estates of the important Anglo-Saxon landowners as named in the Domesday Book. He identified a Royal estate based on Orston, which had jurisdiction over Scarrington, Screveton, Thoroton, Car Colston, and Aslockton. He thought it significant that in the 11th century Bingham was one of the few Nottinghamshire properties of the important Earl Tosti, and suggested that the Crown may have given it to him in connection with his duties as Earl. Adding to this the fact that Bingham was the administrative centre for the wapentake with its meeting point nearby, he speculated that Bingham with Orston and its associated villages together may have formed a late Anglo-Saxon Royal estate based on Bingham, which in turn could have been based on a single Roman estate based on Margidunum or one of the nearby villas. Although there is evidence of 5th century British and later Anglo-Saxon occupation of the Roman town of Margidunum, the postulated division of the area surrounding it into four Anglo-Saxon estates does raise a question about the status of Margidunum in the 5th-8th centuries, while the model raised by Bishop removes the focus from Margidunum to Bingham in the Late Saxon period. In other words, neither model provides an easy justification of the continued occupation of the site of the Roman town after the 8th century. The old name for the area around Margidunum is Castle Hill and when Stukeley (1726) visited the area there were visible remains of stone structures there. For a place that has very little available building stone is seems unlikely that Roman stone structures could have lasted above surface for 1300 years after the Romans left these shores. In 1586, when we know that the Bingham manor was farmed as a single, open-field estate, from its nucleated central village, this area was an isolated part of North Field, surrounded by demesne lands and common grazing. As shown on the 1586 conjectural map nearly all the demesne land in Bingham is situated close to the Margidunum roundabout (Figure 3.29) and the demesne fields have lower finds densities than the fields used as common pasture or meadow. Why the demesne lands should have been there and not near Bingham village is an interesting question. Dr Thoroton wrote in 1677 about one of the several manors in Car Colston: ‘at the south-west end of the Town [ie. Car Colston] lying next Bingham is situate a Messuage which in the time of Edward the First (1272-1307) was the dwelling place and inheritance of John-in-the-Willoughes and continued in that name two or three descents more’. (Thoroton, 1677). Although details of the subsequent descent are confusing, the manor house appears to be identified as Manor Farm in the Hall Close near the site of the Roman villa in Car Colston (Blagg 1970 and O’Brien,1977). This manor was purchased by a junior branch of the de Bingham family in 1330 who held it for about 200 years, long after the senior branch in Bingham had died out in c.1390. It is just conceivable that the original manor house was at or near Margidunum, but just inside Car Colston township and that during the period c.1330 – 1390 the de Binghams were also farming the demesne land on the Bingham side of the boundary, as they were relatives. Such a settlement here would have the benefit of the Oldwark spring, the source of water for the Roman town of Margidunum. There is additional evidence, though tenuous, in the details of a watermill near Margidunum. Sometime between 1147 and 1176 the mill called ‘Burmill’ (‘mill near the burgh or fort’) was granted by a relative of the Paynell family, who were lords of Bingham manor, to Thurgarton Priory together with the ‘multure’ of Bingham & ‘Waterholm’ (? The Holmes to the north west of Parson’s Hill) (Foulds, 1994). ‘Multure’ was the right to collect a toll from manorial tenants who were required to use the mill to grind their corn. There is the possibility that the Priory’s miller farmed part of the land around the mill. This body of evidence seems to suggest that Margidunum, or somewhere very close by, was inhabited and the land around it farmed from there at least to the end of the 14th century. The distribution of finds around Margidunum provides additional evidence that it was occupied from the 11th possibly until the end of the 15th or early 16th centuries. Among the several sites postulated to have been occupied during the medieval period Parson’s Hill is the most unusual. Crop marks and pottery scatters indicate Iron Age and Romano-British settlements here. An inhumation site nearby indicates possible Anglo-Saxon activity and arguments have been made elsewhere that the modern agricultural processes used on this farm would not allow Anglo-Saxon pottery to survive in the soil. The hill was once an island near the northern edge of a lake and throughout the prehistoric period there would have had open water to the south. In later times it would have been surrounded by marsh or boggy land until drained. Geologically, it is part Hollygate Sandstone, which is water bearing, and partly by the underlying Edwalton Formation clays. There would have been a spring line along the boundary between the two formations. Thus, all the requirements for long-term occupation were in place: good soil, fresh water and a locality that was well protected from potential attackers by the surrounding marshes. On the 1586 conjectural map it is named as the “Holmes” and is shown as moor under common grazing, but from the 10th century to the mid 14th century it appears to have been under arable cultivation. None of the medieval finds densities here are very high, but for the 12th to mid 14th centuries the levels are similar to the fields at Margidunum. Jones (2004) postulates that the density of domestic waste spread in arable fields is proportional to the population of the source area for the manure. The moderate levels here, which reach 13 finds per hectare (at 10%) may reflect nothing more than that there were few people living on Parson’s Hill. The origin of the open field system of farming is not known. Orwin and Orwin (1967) in their classic study of the open field system, while expressing the conventional view of the time that open field farming came to England with the Anglo-Saxons, admitted that in Germany there was no evidence for it prior to the 12th century. Hallam (1988) claimed that the same could be said for England. However, according to Williamson (2003) some kind of communal cultivation in intermixed strips is implied by a law of King Ine, dating from as early as the 7th century. He also refers to a charter that infers the probable existence of large open fields in Berkshire in the 10th century, but there is little evidence to show how extensive this type of farming was. In Bingham, the first indication of arable cultivation over large parts of the parish is in the distribution of sherds of Late Saxon and Saxo-Norman ware types. The first map that we have that shows the boundaries of arable open fields dates from 1586 (Figure 3.33). The question, then, is what happened between these two dates? The climate in the 10th and 11th centuries was warm and dry (Esper et al., 2002) and grain was widely being grown commercially in England. The distribution of the pre-Conquest Saxo-Norman fabrics (Figure 3.25) seems to indicate that by the 10th century the area around Bingham manor was following this national trend. Evidence provided by Fagan, (2000) shows that in the northern hemisphere the 13th century a persistent low-pressure trough over Greenland caused the stabilization of a high-pressure zone over Europe. In the years 1284 to 1311, particularly, the climate was warm and dry and May frosts were rare. During this period vines were grown in areas that had not previously known vineyards. The loss of Bingham’s wood pasture, which had happened prior to 1237, suggests that the local response to this prolonged period of warm weather and population growth in the early 14th century (Gimpel, 1988) had been due to a progressive drive to bring more and more land under arable cultivation. From the pre and post-Conquest Saxo-Norman pottery scatters (Figure 3.26) it is evident that the three open fields known to exist in 1586 in the south of the parish were not present in the 11th century. The wood-pasture remained and all the scatters for this period can be accounted for by postulating manure sources in dispersed farmsteads round the edges of the parish, and possibly also a settlement at the site of the present-day Bingham town centre. By the 12th century (Figure 3.27) most parts of the parish that later were known as the North, East, South and West open fields, were being farmed and in the13th-14th centuries the whole of this area was being farmed. The questions arise, at what stage in this process were the open fields defined and over what length of time did it happen? Nothing can be deduced about the introduction of strip farming, but the scatters of 12th to early 13th century fabric types indicate that by the 12th century (See Table 3.2) the finds densities for the area that was later called South Field are greater than for the East and West fields and this relationship remains consistent from then onwards. South Field lies immediately to the south of Bingham and may have always been worked by farmers living there. The conjectural western boundary of South Field is close to and may have even been coincident with the eastern edge of the putative wood-pasture and it is conceivable that the open fields shown on the 1586 conjectural map were defined with respect to the old established South Field when the area converted to arable cultivation was expanded from the 12th century. *North Field (south) is the part of North Field to the south of the current Bingham conurbation. The distribution of 16thC and 16th/17thC fabric types (Figures 3.33, 3.34 and 3.35) reflects the organisation of the land shown on the 1586 map. Ox Pasture, which is adjacent to the modern Lower Brackendale farm on the 1586 conjectural map, is almost free of finds as is much of the area of common grazing in the north and the demesne lands. The scatters on the four arable fields are well spread. This overall distribution is in marked contrast to those shown for earlier periods, where, among other differences, there is a tendency for high concentrations of finds to occur in several areas around the margins of the parish. The timing of the change can reasonably be put to late in the 15th century on the basis of the contrast in distribution between Cistercian Ware, which probably appeared in Bingham at that time, and the earlier ware types. This means that there is neither documentary nor physical evidence to suggest that the land in Bingham parish was divided into the four open fields, meadow and common grazing known to exist in 1586 before around 1480 AD, which was a decade or so after the Stapleton family acquired the manor. It is proposed that it was at this time that village nucleation was finally completed, the farms around the parish boundary that existed in the 13th-mid 14th century became depopulated and the land management plan implicit in the 1586 map was implemented. Figure 3.33. Distribution of Cistercian Ware finds on a background of the 1586 map. Note that there are hardly any on Ox Pasture. Figure 3.35. Distribution of Sandy Coarse Earthenware showing a closer similarity to Cistercian Ware than to Yellow Ware. Therefore, a system is required for the period 12th to late 15th centuries that can accommodate a set of farms distributed on the parish margins around a central village. Rowley (1982) considered that furlongs, not fields were the unit of crop rotation and that it was not necessary to have large open fields to implement the triennial crop rotation system. Indeed, it is claimed in The Agrarian History of England and Wales (Part II, ed H.E Hallam, 1988) that there is little evidence of open fields “after the end of the 10th century and before the 12th century anywhere in England”. Many manors were let out at the time of the Domesday Book and remained so until demesne farming was revived in the 12th century. Moreover, the normal landed basis for a knight at the time of the Domesday Book was 1.6 hides, about 200 acres, which would leave a considerable part of the Bingham manor in other hands. Furthermore, the case of Chesfield in Hertfordshire is used to show that in the 14th century the arable acreage was divided into three “seasonal” fields of approximately equal size, but where each “season” is not made up of a solid block of land, but many fields (or furlongs) in several locations. It is not unreasonable, then, to postulate that in Bingham strip farming and triennial rotation in large open fields are not incompatible with a manor consisting of several farms sited around the periphery of the parish as well as in the central village, though the open fields may not have had the same boundaries as those shown on the 1586 map. Strip farming in unenclosed fields was practiced in Late Anglo-Saxon times. During the 9th and 10th centuries the area under arable agriculture was expanded by clearing woodland and ploughing up pasture, but a large area of wood-pasture was left untouched. During the 12th century the remaining woodland and wood-pasture was cleared to maximise the availability of arable land. In the south-west the wood-pasture was cleared by the people in the Lower Brackendale farm/settlement to the boundaries of what came to be known as West Field, but also included the 16th century Ox Pasture. The cultivated area around the farm/settlement at Saxondale roundabout expanded into the wood-pasture to the east and north to become the southern half of North Field. The Granby Lane farm/settlement cleared and ploughed the area that came to be known as East Field. South Field was farmed from Bingham. Parson’s Hill and the area around Margidunum, both of which were arable up to the 14th century and likely to have been strip farmed, were probably farmed as separate, small, individual territories. The presence of ridge and furrow (pictured below) in Crow Close can be explained if this area was part of the territory belonging to Bingham; i.e. was a northern extension of south Field. The scatters of early medieval and later pottery due east of Crow Close could have been within a northern extension of what later came to be called East Field. After the Black Death the population in the dispersed settlements declined, but it was not until around 1480 that the new owners of the manor forced the completion of village nucleation and rationalised the arable fields to make the system of open fields, meadows, common pasture and moor that is recognised on the 1586 map. At the time of the Domesday Book in 1086 Bingham was the administrative centre of the Bingham wapentake, which was referred to as ‘Bingameshou Wap’, meaning ‘Bingham hill’ or ‘mound’, presumably referring to the meeting place site on the top of a hill near Bingham. There is a later reference to a meeting at ‘Mot(e)howes’ in 1375, which was presumably corrupted to Moot-house by 1677 (Thoroton) (see the Anglo-Saxon section for further details of the derivation of the name). Thus, Bingham clearly existed as a place of some importance in Late Anglo-Saxon times, but the precise location of the village is not specified. There is only meagre archaeological evidence of the early history of Bingham town centre. 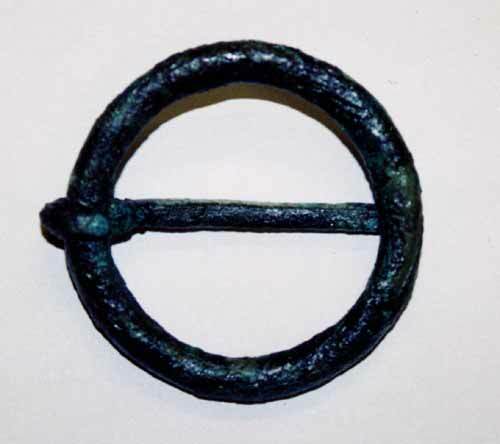 A burial site found during building work on the west side of Market Place revealed a skeleton and two brooches (pictured below) probably from the 13th-14th centuries, but more importantly there were pre-build excavations carried out on a plot of land behind the Chesterfield Arms and facing Long Acre (Rayner, 2006). This produced evidence of Iron Age activity, a Roman enclosure and a late Roman cemetery. A small quantity of 9th-10th century Lincoln shelly ware was recovered, but Rayner (2006) claims that the site appears to have been abandoned as an occupation site from the late Roman period until the 12th-13th century, dated on the appearance of finds of Nottingham Splashed Ware sherds. Bingham is not cited as having a church in the Domesday Book, though this does not necessarily mean that it did not have one. The construction of the present parish church is known to have begun in the early 13th century, but it contains a font, which on design features dates it to around 1100 AD. There is no evidence to suggest the location of the earlier church. St Helen’s, a private manorial chapel founded by the Lord of the Manor, Sir Richard de Bingham, in 1301 is the only other recorded church and it does not survive. By 1314 Bingham was important enough regionally to be given the status of market town. The conjectural street plan for Bingham on the 1586 map, much of which is preserved today, is a classic medieval planned village or town. The village had a main street with cottages or farms along it, each with back gardens of the same length extending to two back lanes parallel to the main street, one to the north and one to the south of it. Lanes linked the back streets to the main street. According to Stroud (2002) the gridiron form of Bingham may have been laid out in two phases. The first would have been Long Acre and Long Acre East, laid out as a village street with back lanes to the south (Grantham Road and The Banks) and to the north (East Street and Church Street). 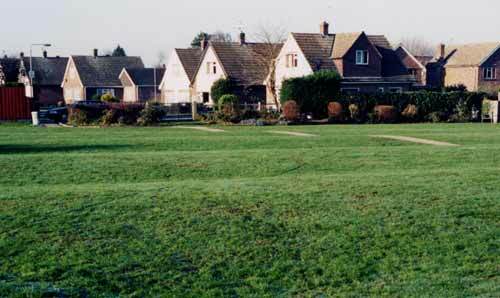 This is similar to some other village plans in Nottinghamshire; e.g. Beeston, Beckingham and Farnsfield and Stroud says that this could have been done at least as early as the 11th century. The second phase, in her view, would have been during the time of Sir Richard de Bingham in the late 13th C as part of his market town development, involving a new market place and adjacent fairground, a manor house, new chapel, and also possibly the rectory site, thus making Church Street and East Street the new axis of the town. However, she admits that the relationship of this new axis, which links directly with the hollow way in Crow Close, to the older main street (Long Acre) to the south of it is difficult to reconcile. Stroud’s analysis deserves re-examination. The Chesterfield Arms site is on Long Acre and Rayner’s work there suggests that it was not occupied in Medieval times until the 12th century. Research done in this project on the 1586 manorial survey shows that most of the big farmers had properties along Husband Street, which later became Long Acre, while, except for a group of three small farms at the eastern end of East Street, only cottagers lived on Church street and East Street. There is no evidence at all of a back street having existed to the north of and parallel to Church Street/East Street. There seems no doubt from this that Husband Street was the main axis of the Tudor town and was unaffected by the presence of the church and market place on a back street. Sir Richard de Bingham and his family lived in Bingham at the end of the 13th and early 14th century. While he may have upgraded the market place and built his manor house on it, this phase of development is nearly a century after the building of the church and is unlikely to be attached to any other major redevelopment. It seems likely that the church and market place were always where they currently are and that the earliest Bingham village developed around the church. The planned layout that we now recognise, and which was relevant in Tudor times, could have been imposed on the original village during the 12th century. The relevance of Crow Close, the site of an alleged deserted medieval village, to the development of Bingham has been investigated during this project. Crow Close is some 800 metres to the east of the centre of modern Bingham and has never been excavated, but a survey carried out during the current project found no evidence of it having been a deserted medieval village. Most of the visible earthworks could be explained as those of a big house and adjoining estate buildings, fields and roads. There may have been a medieval house on the site, but most of the currently visible features appear to be post medieval. It is argued that the house is most likely to have belonged to the Porter family, who were important freeholders in Bingham from 1450 or earlier until the 18th century. The ridge and furrow in Crow Close can be shown to predate some of the ditched field boundaries. This suggests that this land was cultivated in medieval times, probably prior to 1450, as part of an open field system. If there is any evidence of an early settlement in Crow Close it has yet to be revealed. Thus, within the central area of the parish the only credible contender for the original Bingham village is on the site of the current town centre. Evidence from field walking lends some support to this conclusion. From the 12th century onwards, the average density of finds in the area that was called South Field in 1586 is greater than the two arable open fields that flank it. If the conclusions of the Whittlewood project (Jones, 2004) are to be applied here, this would suggest that the manure used in this area came from a source with a higher population that those that supplied the other two fields. South Field is due south of Bingham town centre, but there is ridge and furrow in Crow Close suggesting that areas to the east of Bingham might also have been farmed from there prior to 1450. Thus, although there is no archaeological evidence yet available to indicate precisely the location of the place called Bingham mentioned in the Domesday Book or if Bingham at its present site existed prior to the 12th century, the date of the font in the church and field walked finds distribution make it likely that there was a village, as opposed to a small farm or settlement roughly where the present town centre is from the 10th century. If village nucleation took place in the Late Anglo-Saxon period then this date is pushed back to the 9th century. In the 12th century it clearly had the largest population of any settlement or farm in the parish. A major change in farming practice seems to have taken place probably during the 9th century. Pottery scatters indicate that from the 10th century pasture, woodland and wood-pasture in the southern half of the parish were gradually being brought under arable cultivation. By the early 13th century this process was more or less complete so that in 1237 Bingham had to make an arrangement with Hayward Oaks to supply it with wood. There are two alternative hypotheses regarding village nucleation. In the first there was a partial nucleation prior to the 10th century; Margidunum being the one Anglo-Saxon settlement that is most likely to have survived, but there is also a possibility that Parson’s Hill also survived. These might be the two small manors referred to in the Domesday Book. The re-establishment of new farms around the margins of the parish began with Granby Lane in the 12th century and was complete by the early 13th century, when new farms were established at Lower Brackendale Farm, Saxondale roundabout and, possibly, south Spring Farm. In the second hypothesis, the early Anglo-Saxon settlement sites at Margidunum, Lower Brackendale, Granby Lane and Parson’s Hill continued to be population centres right through the middle ages. The farm at the double ditched enclosure in Starnhill disappeared, but new farms were established in places with as yet no evidence of Anglo-Saxon occupation at Saxondale roundabout and south Spring Farm. In both hypotheses the Black Death initiated a process of decline in the peripheral farms, starting with the disappearance of the settlement on Parson’s Hill. The peripheral farms finally disappeared and village nucleation was completed possibly as a result of a reorganisation of the manor by John Stapleton, who acquired it in 1460-70. It was at around 1480 that the land management plan for the parish shown on the map for 1586, in which there were four open fields, moor, meadow and Ox Pasture, was established. There is evidence to support the notion that a building of substance may have continued to exist at or near Margidunum well into the middle ages. The proximity of the demesne lands shown on the 1586 map to Margidunum suggests that it may have been farmed from there even in the late 15th or early 16th century. There is no documentary or physical evidence to date the introduction of open field farming in Bingham. Wide-scale arable agriculture seems to have been introduced in the late 9th or 10th centuries. Though communal strip farming may have been practiced earlier the possibility exists that this is when open-field farming came to the parish. The presence of farms around the margins of the parish is not incompatible with open-field farming. It is perhaps not a coincidence that in the 13th-14th centuries there is one farm only in each of what in 1586 were identified as open fields. These are Lower Brackendale in West Field, Granby Lane in East Field, Saxondale roundabout in the southern part of North Field, Margidunum in the northern part of North Field and Parson’s Hill in an area that ceased to be arable long before 1586. South Field is presumed to have been farmed from Bingham, though there is a possibility that there was a farm from which the southern part of South Field was worked in south Spring Farm. There is no evidence yet that there was any kind of settlement at the site of the present centre of Bingham between the end of the Roman period and the 12th century, but the distribution of field walked finds from the late 9th century onwards makes it likely that there was a village there at this time. By the 12th century it was the largest of the settlements in the manor and in 1314 it became a market town. Bingham has the characteristics of a planned village. It is suggested that the original village was around the present day church and that the planned village was imposed on it in the 12th century, leaving the church on a back street. The location of the market place at this time is not known. There is no evidence yet that there is a deserted medieval village at Crow Close.